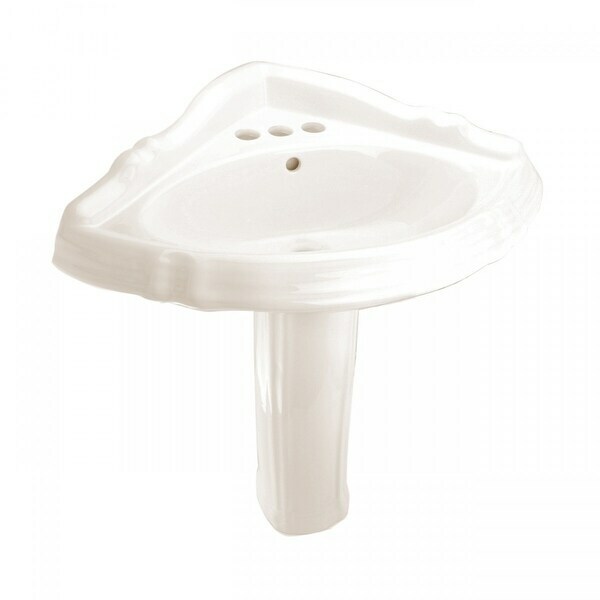 Pick out your Pedestal Sinks here today. The Renovators Supply "Sheffield Deluxe" corner pedestal is the perfect choice to save space in your bathroom. Constructed of durable Grade A vitreous china, the Sheffield manages to be ergonomic, elegant and efficient all at once. This sink features a Reno-Gloss finish that protects from scratches and common household stains. The pedestal's back is open for easy installation and concealment of pipes, and there's a backsplash to protect your wall from water damage. The Sheffield can accept a 4" centerset faucet or a single hole faucet if a backplate is used (FAUCETS NOT INCLUDED). Features an authentic Renovator's Supply logo. - Bone Vitreous China made. - Scratch and Stain Resistant Reno-Gloss Finish. - 4 Inch Centerset Single Hole Faucet (NOT INCLUDED). - Elegant look,protects from scratches . - 37-1/4" H x 26" W x 20-1/2 " Proj. - One (1) Pedestal Sinks. Dimensions 20.5 In. X 26.0 In. X 37.25 In.